The Render Tab lets you set rendering size and quality. Use Medium for sample renderings until you get lighting and other things set for your model. Processing time and memory usage are directly (linearly) related to the total number of pixels in your rendering. The higher the resolution, the longer the rendering will take and the more memory it will require. Set passes to 40 (default), 20, or less while testing lighting and appearance. Set either setting to 0 to disable that limit. Scenes with reflected light and/or area lights will improve the longer you let them render. Autosave - if not 0, then an image of your rendering is saved after every N passes. Using all lights (100%) in every pass, will let you see the effects of all lights in the first pass, but will take a long time. Using about 33% (1/3rd) of the lights per pass seems to work best - adjust as needed. Load and Save Views from rendered images and models. 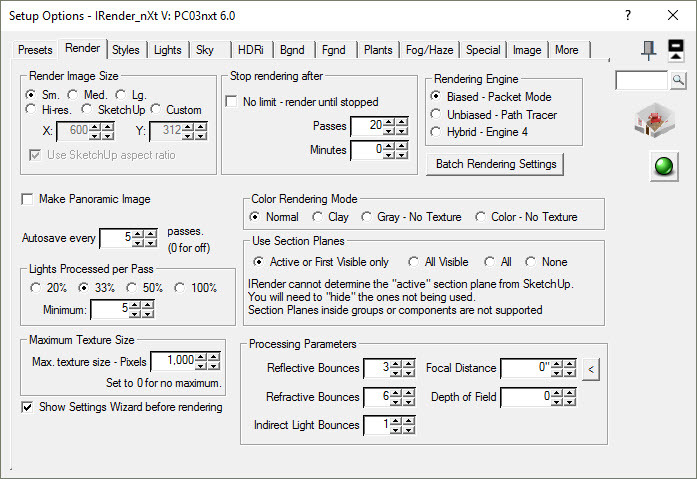 Select the rendering engine for rendering. Quick Draft is about 4 times faster and should be used, along with a smaller rendering size while you are working on your model. High products a full, high quality rendering. This specifies how many time light is process when refracting through click glass. 3 is usually OK. However, if you have scenes with glass cases, or thick glazed windows, you may need to increase it to 8 or more. Determines how many time reflection is processed. 6 is a good default. Use higher numbers for special situations, or lower values to speed up rendering when only 1 or 2 levels of reflection are required. Sets folders and options for nXtRender Batch. Will also allow you to complete the rendering process on other computers. Show Settings before rendering - loads a dialog of rendering setting before rendering so you can check your settings.